At Robert Treman State Park (30 minutes away from Catharine Cottages) you can swim at the bottom of the waterfall. Left on Rt 14 (1/3 mile) to Havanna Glen Rd. Right on Havanna Glen Rd (1 mile) to end at Rt 224. Right on Rt 224 (6 miles) to Rt. 13. Left on Rt 13 to Rt 327. Left on Rt 327 to Robert Treman State Park. 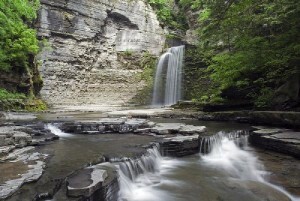 Just 7 minutes north of Catharine Cottages is the most famous of the Finger Lakes State Parks. 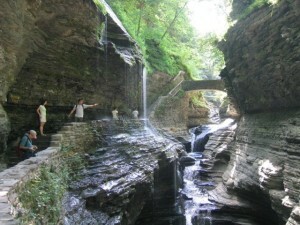 Watkins Glen State Park has a reputation for leaving visitors spellbound. The main attraction is the George Trail which wanders under, around, and through 19 waterfalls. TIP: With small children, drive to the North Entrance (the top) and walk DOWN the 900 steps. Then take the park provided bus back up to the top parking lot. EXTRAS: At the South Entrance there is an olympic size swimming pool, a kiddie pool, a playground, and a picnic area. 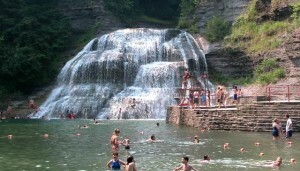 Left on Rt 14 (3 miles) through the town of Montour Falls to the town of Watkins Glen. Left on Rt 14 (3 miles) through the town of Montour Falls to the town of Watkins Glen to W 4th St.
Left on W 4th St, turns into Rt 409 (2 miles). North Entrance is on the left. Left on Rt 14 (3 miles) through the town of Montour Falls to the town of Watkins Glen to Rt. 329. Left on Rt 329 to the South Entrance on the right. Two minutes north of Catharine Cottages is Havanna Glen Park where you can hike to the top of an impressive waterfall in 5 minutes. Then come back down and picnic or enjoy the childrens playground. Drive into the park to the end of the main road to a Trellis. Park and enter the path through the trellis.